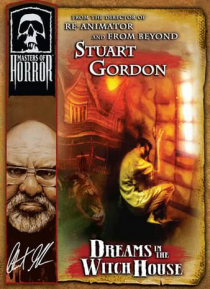 When stressed-out student Walter Gilman (Ezra Godden of DAGON) rents a room in a decrepit old house, his graduate thesis studies begin to take some very strange twists. He suffers nightmares about a voracious rat with a human face. He suspects that a gateway to another dimension may exist behind his wall and is seemingly seduced by a luscious she-demon who thirsts for souls of the innocent via a c… ovenant that screams for blood. But when Walter must face the most depraved urge of all, will the line between madness, murder, and unholy mayhem be crossed forever? Chelah Horsdal (HOLLOW MAN 2) and Jay Brazeau (INSOMNIA) co-star in this disturbing shocker directed by Stuart Gordon, co-written by Gordon & Dennis Paoli (THE DENTIST, CASTLE FREAK), and based on the infamous short story by horror master H.P. Lovecraft.